Codonics, the most trusted name in nuclear medicine imagers, provides the total print solution for all of your functional imaging hardcopy needs. Horizon, a multi-media imager, eliminates the expense of maintaining three printers by incorporating a film imager, a color printer and a paper printer into one incredibly versatile desktop device. Horizon automatically prints color and grayscale without the need to ever switch cassettes or remove ribbons. 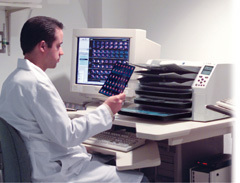 Our exclusive Medical Color Matching (MCM™) technology ensures prints always match color scales and soft copy monitors. 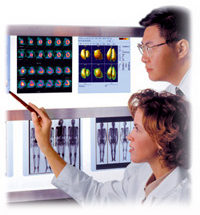 Horizon's unique ability to print grayscale and color in one imager makes it the only choice for demanding nuclear medicine applications requiring large and small format film for PET, PET/ CT, multi-slice and whole body bone studies, color for SPECT, PET and PET fusion, plus low cost grayscale paper for patient and referral copies. In a class that far surpasses any office product, DirectVista® Paper is a high quality media ideal for the referring physician that provides up to 70% savings over film.